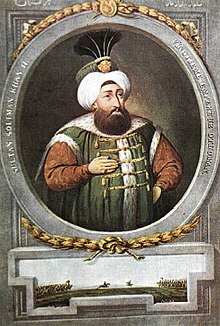 Suleiman II was born on 15 April 1642 at Topkapı Palace in Constantinople, the son of Sultan Ibrahim and Aşub Sultan, a Serb woman originally named Katarina. Suleiman was only 3 months younger than his half-brother Mehmed IV, who was born on 2 January 1642. After the deposition and execution of his father in 1648, Suleiman's half-brother Mehmed came to the throne. In 1651, Suleiman was confined in kafes (cage), a kind of luxurious prison for princes of the blood within the Topkapı Palace (it was designed to ensure that none could organize a rebellion), and he stayed there for 36 years until he took the throne in 1687. Shortly before he assumed the throne, the Ottomans suffered a devastating defeat at the second Battle of Mohács in 1687. In 1688, Suleiman II urgently requested for assistance against the rapidly advancing Austrians, during the Ottoman–Habsburg War, but Mughal Emperor Aurangzeb and his forces were too heavily engaged in the Deccan Wars against the Marathas to commit to any formal assistance to their desperate Ottoman allies. ^ a b c d e f M. Çağatay Uluçay, Padişahların Kadınları ve Kızları, Ötüken Publications, p. 113. ^ Mughal-Ottoman relations: a study of political & diplomatic relations ... - Naimur Rahman Farooqi - Google Boeken. Books.google.com. 1989. Retrieved 29 April 2012. This page is based on the Wikipedia article Suleiman II; it is used under the Creative Commons Attribution-ShareAlike 3.0 Unported License (CC-BY-SA). You may redistribute it, verbatim or modified, providing that you comply with the terms of the CC-BY-SA.